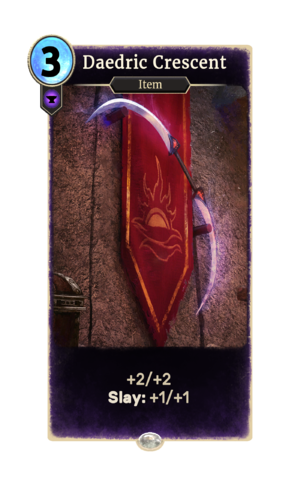 Daedric Crescent is a common Endurance item card. It is part of the Houses of Morrowind expansion. The Daedric Crescent weapon previously appeared in Battlespire, and later as an obtainable weapon in TES III: Morrowind. For lore information, see this page. This page was last modified on 24 September 2018, at 22:34.